Event includes a fully catered dinner, cash bar & bowling. GRAB your friends & relatives to MAKE A TEAM & BOOK ONLINE. EASY PAYMENT through PayPal or by credit card. This is a very exciting time for the Allentown & Millstone Pop Warner Football & Cheer Program as we continue together. Looking to start off the 2018 Pop Warner Season with our merged Allentown & Millstone teams, we are hosting our 3rd Annual Bowl-A-Thon to raise money for our program. PLEASE come out & SUPPORT our Pop Warner Youth Teams! ALL are encouraged to attend whether you currently have a child in the program or would like to support one you know. PLEASE NOTE: This is an Adults Only event. SPECIAL THANKS TO LA PIAZZA FOR GENEROUSLY CATERING THE DINNER FOR THE EVENT! 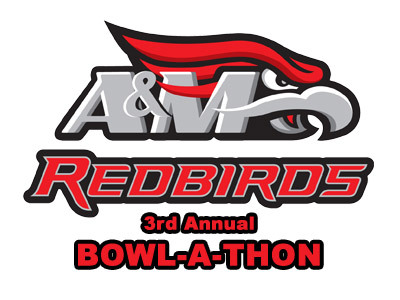 You can still help out the A&M Redbirds by becoming a SPONSOR or making a DONATION to our event! MELODY APPEL, REALTOR - GLORIA NILSON & CO.
TLP CLIMATE CONTROL SYSTEMS, INC. US WATER TREATMENT & CO.
Sign displayed on lane at event, through Memorial Day Weekend, at bowling alley and at our home field throughout the football/cheer season. For more information, visit our website at www.amredbirds.com.